An impressive first up performance by Frolic in Saturday’s Group 2 $200,000 Light Fingers Stakes (1200m) at Randwick will give trainer Edward O’Rourke plenty of confidence to map out a Group 1 campaign for the filly. Frolic, above, will step out in the Light Fingers Stakes at Randwick. Photo by Steve Hart. O’Rourke is hoping that Frolic can reproduce her powerful finishing burst that saw her run second to She Will Reign in the Group 1 $3.5m Longines Golden Slipper (1200m) at Rosehill almost twelve months ago and set her up for another successful Autumn Carnival. The Randwick trainer is looking to the Group 1 $500,000 Surround Stakes (1400m) at Randwick on March 3 and the Group 1 $600,000 Coolmore Classic (1500m) at Rosehill on March 17 as possible Autumn Carnival targets. 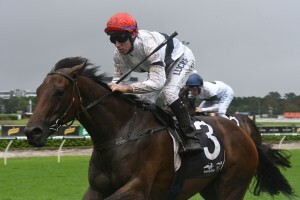 “There’s not many soft places to go with a filly like this,’’ O’Rourke told Racing NSW News Desk. Frolic will be having her first run back from a spell since finishing seventh to Invader in the Group 1 $1m Inglis Sires’ (1400m) at Randwick and O’Rourke said that the Husson filly has strengthened and matured during her time off. “She’s matured into a bigger and stronger filly but she still has the same attitude,’’ O’Rourke said. “She never really works flashy at home so it’s hard to get a real guide on if she’s back. Frolic has had two barrier trials at Rosehill to prepare her for her comeback and O’Rourke said that Hugh Bowman was happy with her latest third over 1000m on February 5. “Hughie Bowman was happy with her last trial so I suppose you can’t ask for any more than that,’’ O’Rouke said. Bowman won’t be riding at Randwick on Saturday because of a careless riding suspension which has allowed Jason Collett to take the mount on Frolic who drew the outside barrier in the fourteen horse Light Fingers Stakes field. Early betting for the Light Fingers Stakes at Ladbrokes.com.au has Frolic marked at the double figure odds of $12 with the James Cummings trained Alizee at the head of the betting at $1.85. Alizee has drawn nicely at barrier four with Glyn Schofield in the saddle and will be facing the starter for the first time since running third to Aloisia in the Group 1 $500,000 Schweppes Thousand Guineas (1600m) at Caulfield during the 2017 Melbourne Spring Carnival.